Portsmouth and Jutland: the forgotten battle? If you had to pick one sea battle with which Portsmouth is irrevocably linked, it would probably be the Battle of Trafalgar. In terms of Portsmouth’s place in the nation’s history, Trafalgar, Nelson and 1805 probably represents the most glorious example of how Portsmouth helped to launch the Royal Navy onto the worlds seas. Yet 111 years later, thousands of Portsmouth sailors and literally hundreds of ships with Portsmouth connections fought out one of the largest sea battles in history. Almost 9,000 men were killed on both sides, compared to ‘only’ about 1,500 at Trafalgar. Why is it that hardly no-one knows about the Battle of Jutland? Why has Portsmouth’s role in supporting the Royal Navy of 1914-18 been almost completely overshadowed? HMS Victory at Trafalgar – of her crew of 846, only FIVE men were born in Portsmouth. True, most of the other 841 may well have lived in or at least visited Portsmouth at some point in their lives, but five people still represents only 0.6% of her entire crew. My research has shown that at Jutland, on the capital ships this figure was nearer 10%. So far, I have found 492 men from Portsmouth who were killed at Jutland. By ‘from Portsmouth’, I mean people who were born here, or were born elsewhere and moved to the town. The true figure of Portsmouth dead at Jutland will in all likelihood be much higher, as many men entered on the Commonwealth War Graves Commission‘s website have no location details, so it would take an awful lot of work to go through each of the 6,000 Royal Navy fatalities to identify if they had any Portsmouth connections. I would guess that the likelihood is that out of a Battlecruisers crew of say 1,000, a large percentage are likely to have either lived in Portsmouth, or been born there. And what about the men who might not have been born here or lived in the town, but spent significant time in the Naval Barracks, or on runs ashore in Portsmouth? HMS Acasta – Acasta was the lead ship of a class of Destroyers, and was launched in 1912. She was damaged at Jutland, with the loss of six of her crew, one of whom was Chief Stoker George Howe. He is buried in Milton Cemetery, so either he died of wounds or his body was recovered. HMS Ardent – Ardent was an Acasta Class Destroyer launched in 1913. She was sunk at Jutland on 1 June 1916, by the German Battleship Westaflen. Of her crew of 75, 10 of those killed were from Portsmouth. HMS Barham – a Queen Elizabeth Class Battleship, Barham has a pretty interesting place in Portsmouth’s history, as possibly the only ship that suffered fatalities of Portsmouth men in both world wars. Commissioned in October 1915, Barham was hit five times at Jutland. 25 of her crew were killed, including her Chaplain, who came from Portsmouth. Reverend Henry Dixon-Wright was born in Wallington in Surrey, but in 1916 was living in Stanley Street in Southsea. He obviously died of wounds, as he is buried in Lyness Naval Cemetery near Scapa Flow. HMS Black Prince – Black Prince was a Duke of Edinburgh class armoured cruiser launched in 1904. She was sunk at point blank range by five German battleships on the night of 31 May and 1 June 1916. All of her crew of 857 were lost, with 99 of them coming from Portsmouth. HMS Broke – Broke was a Faulknor class Destroyer Leader launched in August 1914, originally built for the Chilean Navy but taken over by the Royal Navy after the outbreak of WW1. 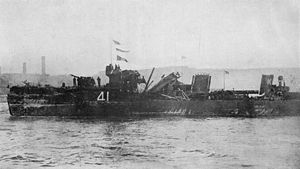 HMS Broke was devestated by fire from the Westfalen, killing 50 of her crew and wounding 30. 2 of the dead came from Portsmouth. After Broke was hit, she went out of control and rammed HMS Sparrowhawk, causing further casualties (see below). HMS Castor – Castor was a C class light cruiser. She suffered relatively light damage at Jutland, with ten of her crew becoming casualties. One of those killed was from Portsmouth – Chief Yeoman of Signals Daniel MacGregor, aged 38. HMS Chester – Chester was a Town class light cruiser, launched in 1915 for the Greek Navy, but taken over by the Royal Navy after the outbreak of war. At Jutland she was hit by 17 150mm shells; out of her crew of 402, 29 men were killed and 49 were wounded. Two of the dead were from Portsmouth – Chief Yeoman of Signals William Roy, 38 and from Southsea; and Lieutenant George Walker-Williamson, also from Southsea. Boy John Cornwell won a posthumous Victoria Cross on HMS Chester at Jutland. Photos show that the Chester suffered serious damage, and it is remarkable that so few of her crew became casualties. HMS Defence – Defence was a Minotaur class armoured cruiser, launched in 1907. At Jutland she was hit by two salvoes from five German battleships, causing her after 9.2in magazine to explode. It is believed that up to 903 men were killed, including 14 from Portsmouth. HMS Fortune – HMS Fortune was an Acasta class Destroyer, sunk by fire from the Westfalen. 67 men were killed, and only one was rescued. 14 of those killed came from Portsmouth. HMS Indefatigable – 10. HMS Indefatigable was the lead ship of a class of Battlecruisers, launched in 1909. Shells from the German Battlecruiser Von der Tann caused a catastrophic explosion of her magazines. Of her crew of 1,017, only three survived. Ten of the dead were from Portsmouth, suggesting that she was not, in the main, a Portsmouth-manned ship. HMS Invincible – Invincible was the lead ship of a class of Battlecruisers, and was launched in 1908. Having fought at the Battle of Heligoland Bight and the Battle of the Falklands, by 1916 she was an experienced ship. At Jutland Invincible was sunk by fire from Lutzow and Derfflinger, a shell from which penetrated the Q turret, and caused a huge explosion of the midships magazine. 1,026 men were killed, including 130 from Portsmouth. There were only six survivors. HMS Lion – HMS Lion was the lead ship of another class of Battlecruisers, and was Vice Admiral Beatty’s flagship at Jutland. Lion was hit 14 times, suffering 99 men dead and 51 wounded. 8 of those killed came from Portsmouth She had fired 326 rounds from her main guns. HMS Malaya – HMS Malaya was a Queen Elizabeth class Battleship, and had only been commissioned in February 1916. At Jutland she was hit eight times, and 65 of her crew were killed. One man came from Portsmouth – Cooks Mate Frederick Watts, aged 23. He is buried in Lyness Naval Cemetery near Scapa Flow, suggesting that either his body was recovered, or he died of wounds. HMS Nestor -HMS Nestor was an M-class Destroyer, launched in 1915. She was sunk at Jutland. Many of her crew of 80 were lost, including one man from Portsmouth – Petty Officer Stoker George Hawkins, 29 and from Harley Street in Fratton. HMS Nomad – The Nomad was a sister ship of HMS Nestor, and was only launched in February 1916. She was sunk by fire from the German battlecruisers. Out of her crew of 80 only eight men were killed, but two them were from Portsmouth – Able Seaman Walter Read, 30 and from Norland Street in Southsea; and ERA 2nd Class George Willis. HMS Princess Royal -Princess Royal was a Lion class Battlecruiser, launched in 1911. Princess Royal was hit eight times at Jutland, by Derfflinger and Markgraf. 22 of her crew were killed, and 81 were injured. Among the dead were Portsmouth men Leading Stoker George Daniels, 34 and from Southsea; and Royal Marine Gunner Ernest Gamblin, 36 and from St Helens Road in Southsea. The sight of a seriously damaged Princess Royal returning to Portsmouth after the battle shocked many. HMS Queen Mary -Queen Mary was a Battlecruiser, the sole ship in her class, and was launched in 1912. Early in the battle she was hit twice by Derfflinger, causing a catastrophic explosion in her magazines. Out of her crew of 1,284, only eighteen survivors were picked up. 124 of the dead came from Portsmouth. HMS Shark -Shark was an Acasta class Destroyer, launched in 1912. Attached to the Battlecruisers at Jutland, she led a torpedo attack on the German scouting group. She was heavily damaged, and her Captain lost a leg. The ship was abandoned, and only 30 of her crew survived. Among the dead were 15 Portsmouth sailors. HMS Southampton – A town class light cruiser, Southampton was damaged at Jutland but survived the battle. Out of her crew of around 440, 31 men were killed. Five of them came from Portsmouth. HMS Sparrowhawk – Sparrowhawk was another Acasta class Destroyer, sunk after a collision with HMS Broke (above). One Portsmouth man was killed, Petty Officer Stoker Albert Jones. HMS Tipperary – Tipperary was a Faulknor class Destroyer leader. Launched in 1915, she was originally ordered by Chile, but taken over by the Royal Navy at the start of the war. After contributing to the sinking of the German battleship Frauenlob, Tipperary was sunk by Westfalen. Of her crew of 197, 184 men were lost, including 22 from Portsmouth. HMS Turbulent – Turbulent was a Talisman class Destroyer, launched in January 1916. She was sunk at Jutland by a German Battlecruiser, with the loss of 90 out of a crew of 102. One man came from Portsmouth – her Engineer Lieutenant Reginald Hines, 32 and from Hereford Road in Southsea, an old boy of Portsmouth Grammar School. HMS Warrior – Warrior was a Duke of Edinburgh class armoured cruiser, launched in 1905. Heavily damaged at Jutland, she sank the next day. 743 of her crew survived, 67 were killed. Two of the dead came from Portsmouth – Officers Steward 1st Class Harold Parker, 23; and Royal Marine Bugler William Willerton. Looking at the casualty information, several things appear to be clear. Firstly, the loss sustained by Portsmouth was significant. Secondly, many of the men lost were on battlecruisers – indeed, there was ‘something wrong with our bloody ships’ that day. Sadly, the lack of armoured protection in battlecruisers was not rectified in HMS Hood, leading to even more casualties in 1941. Thirdly, although the German High Seas Fleet had given the Grand Fleet a bloody nose, it was nowhere near bloody enough to wrest supremacy of the North Sea. Much has been written about Portsmouth and Jutland, albeit not in recent years. There are a number of statements that have been made about Jutland and its effect on Portsmouth, that were never substantiated by evidence, and have been perpetuated throughout time. Apparently one street in Portsmouth lost a huge number of sailors killed, it is believed to be 39. Also, it has been said that ‘virtually’ every street in Portsmouth lost at least one sailor at Jutland. It would be interesting to challenge, and either prove or disprove these potential urban myths. Having said that, we know for a fact that many of hundreds of Portsmouth men were killed on 31 May and 1 June 1916. It was almost certainly the bloodiest day – or days – in Portsmouth’s history. It almost certainly had a bigger impact on Portsmouth than any of the Pals Battalion‘s losses on the Somme did on their hometowns. Yet whilst we know plenty about the Northern working class towns that suffered on the Somme, we know virtually nothing about the sailors neighbourhoods of Portsmouth that had their menfolk decimated at sea, particularly at Jutland. People just don’t seem to think of the Great War as being a naval war. Jutland has been almost completely overshadowed by Trafalgar and the Titanic as precursors, the Western Front as a Great War contemporary, and D-Day and ships such as the Hood and the Royal Oak as Second World War successors. Yet Jutland saw much heavier losses than any of these events. 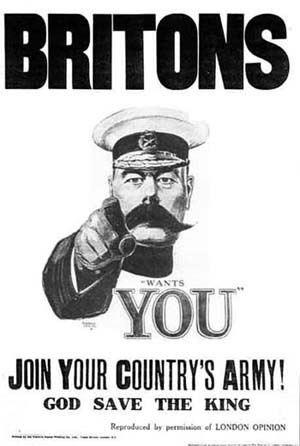 With the euphoric volunteering for the British Army that was experienced in the late summer of 1914, many towns and cities formed their own Battalions for service in the Army. Comprised virtually of volunteers, in many cases these became known as ‘Pals’ Battalions. The word ‘Pals’ is normally applied to midlands or northern working class towns or cities, but my research has shown that the 1st and 2nd Portsmouth Pals – the 14th and 15th Battalions of the Hampshire Regiment respectively – were very much Pals Battalions. And it was quite credible of Portsmouth to raise two Battalions – over 2,000 men – considering that most of her young male population must have been either at sea with the Royal Navy, or engaged on important war work. Fortunately, the war diary for the 2nd Portsmouth Pals is available to download online from the National Archives website, and it tells us an awful lot about what happened to these young men from Portsmouth in those dramatic years. The 1st Portsmouth’s were formed by the Mayor and a local committee on 3 September 1914, and would have taken the initial rush of recruits. After gathering and training locally, it was found that there were still enough recruits to form a second battalion, which took place on 5 April 1915. Several men died before they even left Britain – Private R.P.A. Cornhill on 6 August 1915, who is buried in Kingston Cemetery. After training locally, on 30 May 1915 both battalions were accepted by the war office, and began training for service abroad. With so many raw recruits, so many new units and a shortage of equipment, naturally things happened slowly. In October 1915 the 2nd Portsmouths joined the 122nd Brigade, in the 41st Division at Aldershot. In February 1916 they were at Marlborough Barracks in February 1916, before landing in France in early May. Private H.T. Sait died on 11 March 1916, and is also buried in Kingston. The Battalion disembarked at Le Havre at 0600 on 2 May 1916, marching to a rest camp from the port. The next day they entrained at 1139, before detraining at Godewaerveld the next day and marching to Meteren. After three days in billets at Meteren, the Battalion marched to new billets in the La Creche area. On 10 May 12 officers and 40 NCO’s spent two days in the trenches, attached to the 11th Royal Scots, in order to gain experience. Whilst they were there they experienced some heavy bombardments, and then an attack on the Royal Scots trenches. Two were repelled, but a third gained access to the Scots front lines before being pushed back. All was quiet again until the 18th, when a gas alarm was raised. The Battalion stood to at 0115, and stood down at 0150. The next day more men went into the trenches for experience, this time 4 officers and 80 NCO’s. On the 25th the Battalion suffered a sad casualty, when Private H. Evans committed suicide. A Court of Enquiry found that he had become temporarily insane. Private Evans was buried in Bailleul Communal Cemetery Extension (Nord), but unfortunately his record on the CWGC does not give any information as to where in Portsmouth he lived. On the 28th the Battalion marched from La Creche to billets at Creslow. Two days later on the 30th they moved up to the front line at Ploegsteert Wood, taking over trenches from the 8th Black Watch, between Le Gheer to opposite the Birdcage. A, B and C Companies were in the front line, with D Company in reserve. Ploegsteert was often used to give new units experience, rather than the more active Ypres Salient.